Home buyers had many more options to choose from in February as housing market inventory increased 7 percent to 7,442 homes in February 2019 compared to 6,912 in February 2018. 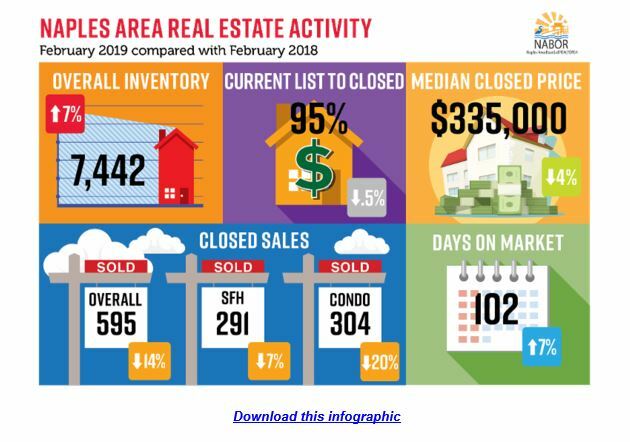 In addition to 1,498 new listings added to the Southwest Florida MLS in February, the February 2019 Market Report released by the Naples Area Board of REALTORS®, which tracks home listings and sales within Collier County (excluding Marco Island), also reflected a 4 percent decrease in the overall median closed price to $335,000 in February 2019 compared to $350,000 in February 2018. 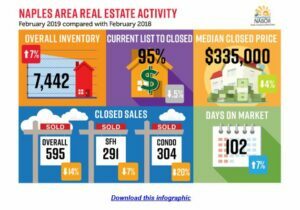 While there were 100 fewer closed sales in February 2019 compared to closed sales in February 2018 (a 14 percent decrease), the added inventory has broker analysts convinced that buyers are not rushing into a sale like many did when inventory levels were much lower; and instead, are meticulously evaluating all their options that include new and existing homes. The average days on the market increased in February, which tells me that buyers are looking at more homes before they make an offer. Plus, there is a lot more new construction this year than a year ago. Agents were rarely in the office in February because showings really increased dramatically. I help buyers find the right homes at the right price in the right area faster because I understand how each geographic area and the neighborhoods within them are different. For example, closed sales of single-family homes near the beach decreased in February compared to a year ago while its median closed price increased; but closed sales of single-family homes increased in the South Naples area during February and its median closed price fell. The high-end market continues to do very well in our area, Those high-end sales are usually made by very astute buyers and if the economy was bad or on a path to becoming bad, then they wouldn’t be buying as they are currently. You can’t look at our market with only one lens, a lot can change in a quarter mile. Sellers are best served when they work with a REALTOR®, whose job is to offer home buyers and sellers a good understanding of neighborhood market trends and comparative pricing strategies. This is very important during high season, and especially today, when buyers have more housing options. If you are looking to buy or sell a home in Naples, I have the experience and knowledge to provide an accurate market comparison or negotiate a sale. A REALTOR® can ensure your next purchase or sale in the Naples area is a success. Search for your dream home and find a Naples REALTOR® on Naplesarea.com. It would be my honor to serve the real estate needs of you and your friends and family. Please contact me, David Critzer for additional information, and to arrange to view homes, call 239-285-1086 or email david@davidflorida.com.